For an easy Southern-inspired dessert, learn how to make the best easy peach cobbler recipe around. The kind your grandmother used to make, with a few simple, delicious ingredients. This cobbler is, in my opinion, best served with some vanilla bean ice cream for the full tasty effect. This sweet dish is one of my all-time favorite easy dessert recipes and is the best cobbler I have in my recipe box. Not only is it the best it is the easiest way I have ever made peach cobbler and by far turns out the most delicious. 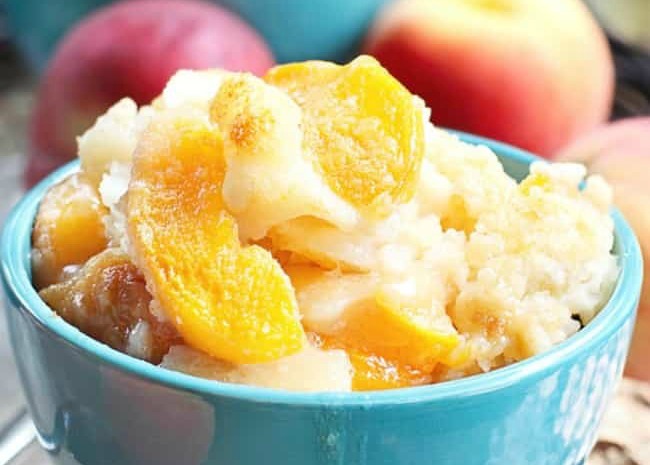 If you have been looking to learn how to make “the best peach cobbler recipe ever” then look no longer, this dish will be right up your alley. It is great for an after dinner dessert or when you need a simple but amazing dish to bring to your friends because it is quick to make. A sweet ending to any meal. Melt your stick of butter and pour into a 13×9 dish. Mix together your milk, sugar, flour and the drained syrup from your sliced peaches. Pour the mixed ingredients over top of the butter. Add the peaches layered to the dish but do NOT mix. Bake in the oven for approximately 1 hour or until the crust rises and is golden brown. 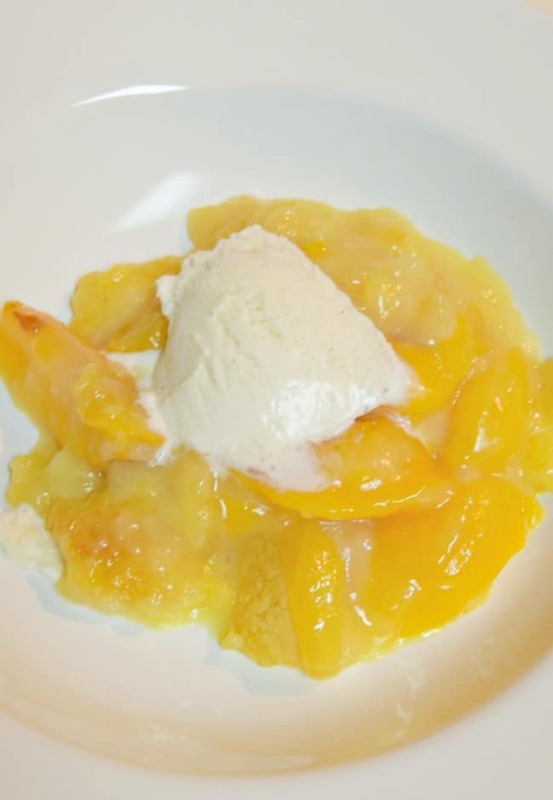 Here is some quick step by step directions in video form to make this easy peach cobbler with canned peaches. Whether you use canned, fresh or frozen peaches will depend on the time of year and what you can find on hand, but we typically use canned because it makes it that much easier. So the directions you will find here are for using canned peaches. Whatever the season, this dessert will bring you all of the praises. Watch the video tutorial or keep scrolling for the printable details. Like I said above, this dish is great by itself but even more delicious with vanilla bean ice cream. Of course, this is our favorite way to have it. Let that ice cream melt over the hot cobbler for just a little bit and you have the perfect touch of warm and cold. Yuuuuuum! 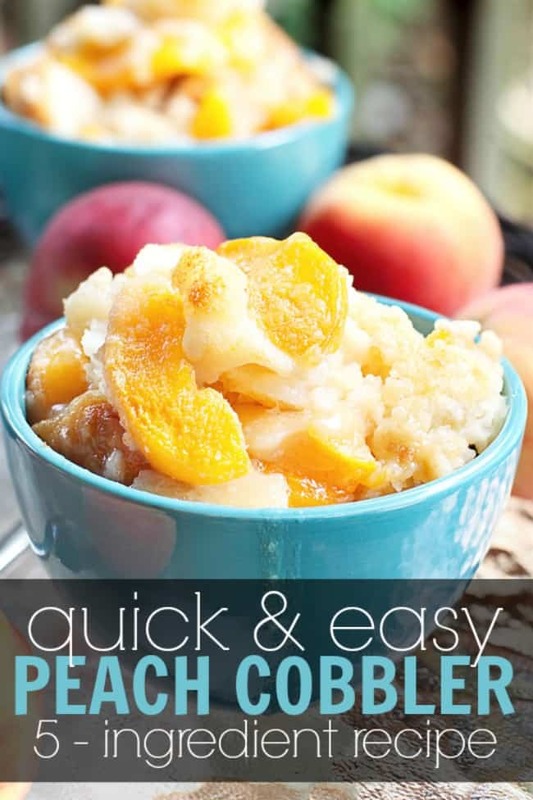 Here are some of my favorite items I use when making this easy peach cobbler recipe. Melt your stick of butter and pour into a 13x9 dish. 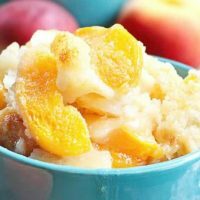 If you enjoyed this easy peach cobbler recipe you might also enjoy these other simple dessert recipes. Oh my gosh I was JUST talking about my peach cobbler recipe with friends on Saturday night!! I have been craving it! I had some peaches I needed to use up before they went bad and only one small can of peaches so I used fresh and cannned peaches and made cobbler. It turned out yummy and any excuse to make cobbler right? Apple is hands down my favorite. The recipe looks super adaptable. I see cherry, blueberry, and raspberry cobblers in my future! It is definitely adaptable to any fruit you like best. Cherry would be delish with this batter topping. YUM! I will definitely have to try different flavors soon. You drain the syrup or use it? Approximately 4-6 depending on how big of servings. This looks delicious! I am going to make it tonight…can I sub Almond milk for reg milk? Carli, I have never tried it with almond milk but I don’t see why you couldn’t. It might change the taste just a little but I bet still just as yummy. About 20 min into baking and it already looks delicious! I’m so excited! 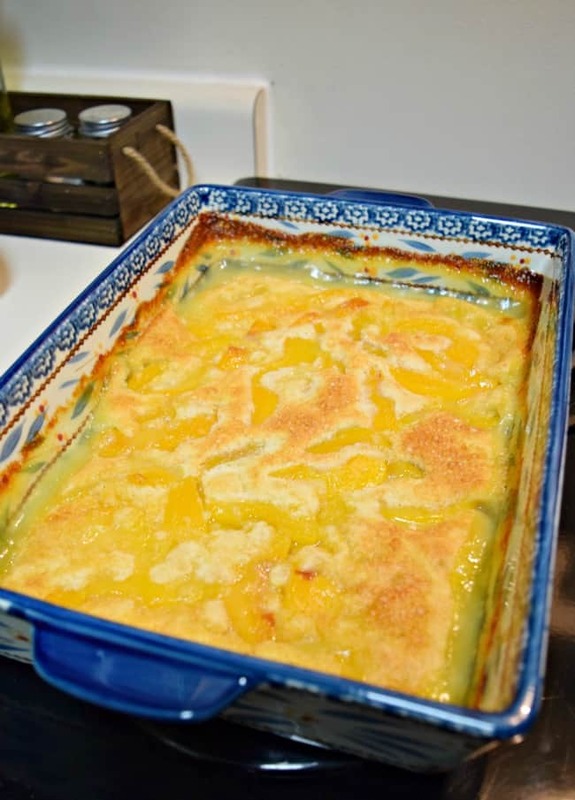 I made this peach cobbler it was fast and easy and my family loved it. Can you use all fresh peaches? I have so many to use up, but just making sure it won’t turn out dry! Stephanie, I have never tried it with fresh peaches because I always use the syrup from the can with this recipe. It couldn’t hurt to give it a try though. It might come out a little drier but I bet still just as yummy. You might could even try blending a peach to give it some of that extra syrup it would be missing from the can. Melissa, I have a HUGE can of peaches ( 6lb 10oz ) so if I measure out the peaches how much syrup do I use ?? I have never measured how much was in the can of a 15 oz of peaches so it would just be a guess. I would say maybe 1/2 cup, if it looks a little dry you could always add a little more. Trying to measure out from a bigger can of peaches would be just trial and error. I love this recipe and have been making it for years. I my original recipe calls for regular flour and 2 tsp. of baking powder (not soda) and 1/2 tsp. salt. So I think either way is good. I never have self-risng flour on hand so this works for me. It is always a hit!!! I made this tonight and it was wonderful… Especially with a scoop of ice cream. I did however, use baking powder and salt. I also added nutmeg and cinnamon. I don’t like to measure things and I kind of just winged it, it turned out perfect! Thanks for the recipe it’s super easy and worth the hour! It’s in the oven and smells heavenly! ! Thanks for the recipe! Aileen, 1 stick of butter would be 4 ounces. I make this but have never used the syrup before. It always comes out yummy and very moist. But I will try using the syrup next time! Could you make this gluten free by using oat flour instead of regular flour? Dixie, I honestly don’t know much about oat flour but from what I have read is that you would have to make some other adjustments for it to come out right. I would suggest searching for a GF peach cobbler recipe if you really need to make the change to oat flour. I made two batches of this peach cobbler and it’s so easy and DELICIOUS!! The only thing I did differently was decreased the cup of sugar to 1/2 c and it was perfect!! I am not that good of a cook. Tonight I made this Cobbler and it was absolutely WONDERFUL. My Boyfriend was PROUD of me, I was PROUD of me. The last 10 minutes I sprinkled Sugar on it to make it even more yummier adding Vanilla ice cream..I even did a Happy Dance ???? Thank you for sharing this great YUMMY EASY RECIPE ???? I made this for my parents and it turned out sooooooo good!!! I added a little cinnamon and vanilla to the flour mixture and and another dab of cinnamon on top about 15 mins before it was done. PERFECT!!! Thanks for sharing. Awesome Chris, so glad you enjoyed it. I will have to try it out with cinnamon and vanilla sometime too. It’s fantastic loved it! My kids loved it my hubby loved it n i loved it! can I substitute the bisquick for flour? Do you mean substitute the flour for Bisquick as this recipe already uses flour? I have never used Bisquick to replace the flour in this cobbler recipe before. You could try it but I won’t guarantee that it would turn out correctly. Also, I would google how to substitute flour for Bisquick because you may need to add some additional ingredients. You can but you will need to add in 1 1/2 teaspoons of baking powder and 1/4 teaspoon of salt. If using fresh fruit crushing and sweetening to taste will provide enough juice. I use fresh fruit that I sweetened. I love this recipe, it’s easy and just like the cobbler my great- grandmother made. I bet using fresh peaches makes it even tastier. The easiest dessert you can make when you need something quick and delicious. I’ve made it several times and my family loves it.